Today I spotted a Ginkgo biloba leaf in the streets. I took a closer look and noticed it had the outline of a face on the edge of the leaf, just like a silhouette. 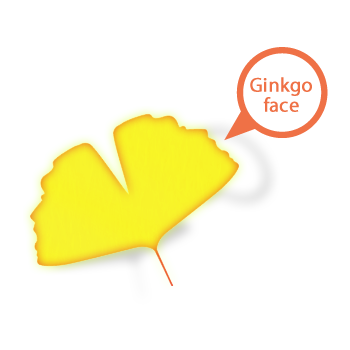 So go out, out in the wind and find yourself some Ginkgo leaf faces! The leaves are unique among seed plants, being fan-shaped with veins radiating out into the leaf blade, sometimes bifurcating (splitting) but never anastomosing to form a network. The old Chinese name for this plant is silver fruit, but that is underrated. Extracts from this tree are widely used medicinal herbs in the world and it is one of the oldest known tree varieties still in existence. Fossils are recognisably related to modern Ginkgo from the Permian, dating back 270 million years. Admit it, Mother Nature is the best designer out there. She always gets the gold medal!